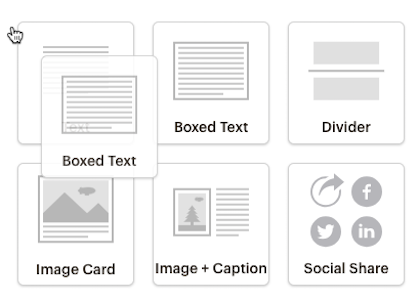 The Boxed Text content block provides several options for adding content, like images and links, to your campaign. You can also use Boxed Text blocks to wrap text around an image, set different background colors behind your text in each Boxed Text block, and more. In this article, you'll learn how to use Boxed Text content blocks in your email campaign. For the same style choices, but without the background-style options, use a Text content block. To insert the Boxed Text content block into a regular email campaign, follow these steps. On the Design step, click and drag the Boxed Text block into your campaign layout. Add your text in the Content tab. If you are pasting in content from an outside source, like a website or word-processing program, use either the Paste as plain-text or Paste from Rich Text Editor option to prevent extra styling code from being added. Make changes in the Style and Settings tabs or click Save & Close if you're done. 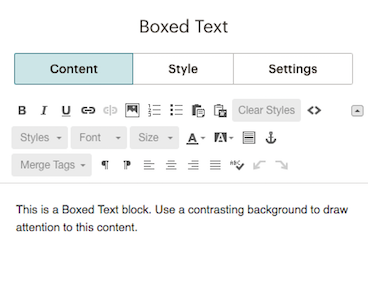 To change the style and settings of a Boxed Text content block, follow these steps. 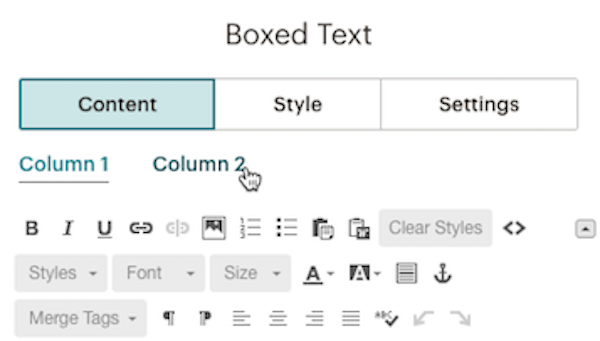 On the Design step, click the Boxed Text block you want to edit. Change the style for the content block in the Style tab. You can change the Text Color, Font Family, Font Size, Font Style, Font Weight, Line Height, and text alignment, as well as the border and background color for the box. 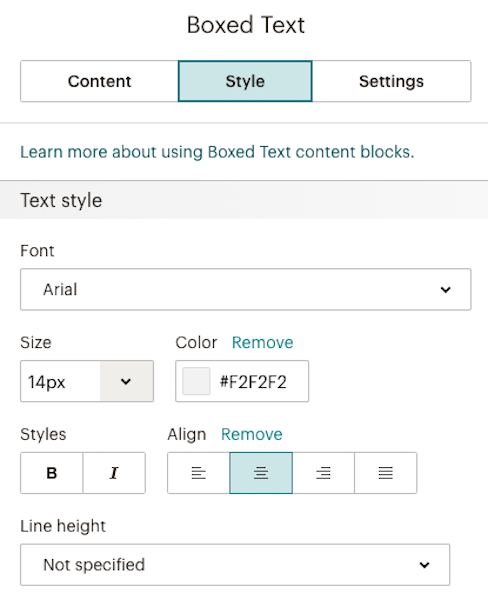 Change these settings for all Boxed Text blocks in your campaign layout by checking the Apply To All Existing Boxed Text Blocks option. In the Settings tab, choose whether to use columns, and set their width under Column Split. Return to the Content tab to make any line-by-line styling changes, or apply styling to just a few words in the content block, using the toolbar in the editing pane. If you set the Boxed Text block to two columns, toggle between the Column 1 and Column 2 tabs to add and edit content. If the styles you apply don't change the text in the way you expect, it's usually because the content was copied and pasted from a website or word-processing program and additional, hidden code was added. Remove extra formatting from your content before applying styling in Style tab. Insert an image and set it to left or right alignment to wrap text around the image. Create a four-column layout. To do this, select a two-column layout on the Template step, add a Boxed Text block to each column, and then set each block to two columns on the Settings tab, like we show above. Use custom social icons instead of the default options provided in Social Follow and Social Share blocks. Upload your own custom-designed icons to a Boxed Text block, and link images appropriately. Social Share Link using the following merge tags and links. 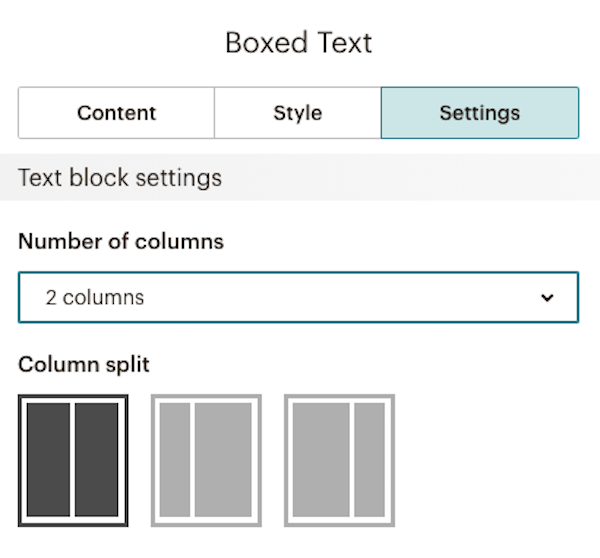 Design a layout with different colored backgrounds for each Boxed Text block. Background colors are set for each campaign layout section—such as header, body, footer. Boxed Text blocks can also call out content sections with color. Learn how to use Mailchimp's Text content blocks to add text, links, wrapped images, and how to change the style and settings for them. Learn how to use Mailchimp's various types of content blocks in your campaign design.